Buffy catches Spike in a moment alone. After Spike endures torture at the hands of Glory to protect the identity of the key, Buffy is forced to reconsider everything she ever thought she knew about the vampire, leading to some startling revelations. Banner by Tanit. Set immediately post-Once More With Feeling and drastically off-canon. Buffy runs out of the alley, away from the emotional danger of her kiss with Spike, only to encounter a danger far greater. Banner by Tanit. Buffy returns to California for the first time in years, and encounters more of her past than she ever expected. Spike and Buffy sit together and watch the sun set. (Too much of a summary will ruin the ending - but you might want tissues). Fic banner made by the incredibly talented Tanit. Spike and Dawn share a moment in time during the hardest summer of their lives. 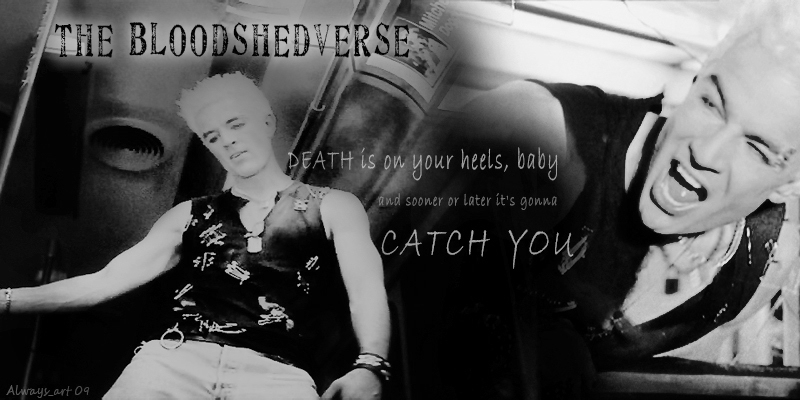 Written for the LiveJournal community, "The Jossverse", Round Two, BtVS character Spike, prompt comfort. Banner made by the incredibly talented Xaphania. You know you wanna dance. Spike knew it, the fans knew it, and this time, Buffy knew it, too. Begins in the alley scene outside the Bronze during Fool for Love and moves swiftly off-canon. Thanks to dampersandspoons for beta reading, and Tanit for the banner. In the summer between seasons 3 and 4, a heartbroken Buffy finds a bit of compassion in an unexpected place. Written for the Livejournal community Spuffy Wonderland's 2010 Art-to-Fic challenge. Banner by the incredibly talented Xaphania. Something wasn't quite right, but what could Buffy do about it? She was no superhero. Season 4, during the episode Superstar, sometime after Buffy and Jonathan encounter Spike but before everyone realizes Buffy's right about Jonathan. After an unexpected reunion, years after the fall of Sunnydale, Spike and Buffy take a walk. This is a companion piece to my previous story, Anywhere, which you really ought to read or re-read first. Set in S6 episode 'Normal Again'. Both Spike and Buffy are stung by the demon, and end up in the same mental institution. The Glargh...Glush...um, the demon has a bit more power in this fic, so Spike and Buffy fall into a coma...a permanent stay in the mental institution. Finding herself in what was once her worst nightmare, Slayer turned vampire Buffy Summers wants revenge on the one who made her. However, when she makes an unlikely ally in the process, she finds herself on a journey that changes her understandings of good and evil, love and hate.